Yoga is a complete science that harmoniously unites the body, mind, and spirit. As a result, it creates a significant difference in one’s behavior, thoughts, and attitude. Daily practice of yoga increases strength, flexibility, sensitivity, intuition, and awareness. Moreover, this is not true only for humans but applies to animals too. Animals are strong, agile, flexible and have a great level of awareness. Hence, there is numerous yoga poses named after animals. As the early yogis were influenced by what was around them, it’s only natural to have yoga poses extracted from animals. As a benefit, it has also made it easy for parents to make to motivate kids into practicing yoga with animal names. Everything in nature along with animals has a sacred gift for humans to learn from. Ensuing, animal poses can help us to connect with powerful aspects of the soul that we often repress in our busy lives. While some postures are not so obvious, there are many yoga postures that evidently portray the shape of a specific animal. So, roll out your Yoga Mats and try for yourself, which of these asanas from below can you perform. Here, is the list of Yoga Poses named after animals. Cobra Pose is a common beginner’s pose, and it’s clear why this pose is named after a snake. “Bhujanga” means “serpent” in Sanskrit, as the pose mimics a serpent rising to strike. This pose benefits the chest, shoulders, spine, and buttocks. Hamsasana or “Swan Pose” is a yoga asana which resembles a swan when performed. Benefits of Hamsasana range from improved digestion to strengthening of the arms and abdominal muscles. In Sanskrit, ‘Hamsa’ means the swan and hence the name Hamsasana. The gentle flow of cow and cat starts with a flat back, kneeling with all joints in line; the arching Cow Pose coincides with the inhale, while the rounded Cat Pose follows with a deep exhale. Marjariasana, or the cat stretch, incorporates the excellent feline stretch in the yoga workout. A favorite of our feline friends, this easy pose benefits the neck, spine, and torso. It is usually performed in a flowing vinyasa with the Cow pose (scroll below). In sanskrit, Marjari means Cat and asana means Posture or Pose, hence the name. Often considered one of the more difficult backbends, the Camel Pose is a great stretch for the whole body, with a particular focus on the throat, chest, abdomen, hips, and thighs. It can lead to lightheadedness, so beginners should be careful not to bend their necks too far backward. One of the most recognizable yoga poses, downward-facing dog (also known as Down Dog and Downward Dog) uses all parts of the body and especially benefits the shoulders, arms, legs, calf muscles and feet. This rejuvenating pose, along with its counterpart Upward-Facing Dog, is an integral part of the Sun Salutation sequence. There are a few variations of this posture. The traditional pose requires your legs to be crossed, while you can also raise your legs off of the ground for 15-30 seconds, or even lay them flat and focus on the upper back. This backbend pose benefits the neck, abdominal region, upper back, and hips. Kapotasana is derived from the combination of the Sanskrit words kapota(pigeon) and asana (posture or pose). The reason for the name Kapotasana is, this pose resembles the pigeon. It is called as King Pigeon Pose in English. Preparatory Poses for Kapotasana are Chakrasana, Virasana, Eka PadaRajakapotasana, Supta Virasana, Bhujangasana and Dhanurasana; and the Follow-Up Poses are Adho Mukha Svanasana, Balasana, Bharadvaja’s Twist and Pasasana Kapotasana is an advanced level yoga pose. It strengthens the spine and opens the chest. It Increases the body flexibility. Kapotasana (kapota meaning “pigeon” in Sanskrit) has many variations. Eka Pada Kapotasana is a yoga posture suitable for intermediate level yoga practitioners. Eka Pada Kapotasana stretches the entire lower part of the body, stimulates the abdominal organs and helps relieve the body of Sciatica. It helps open up the hips and adds more flexibility to the hip region. It is also known to relieve the body of stress and anxiety. Garuda, the king of birds in Hindu mythology, translates roughly to “eagle” in English. This pose can be hard to wrap your mind around, but that’s part of what makes it such a great pose for concentration. It benefits the shoulders, hips, thighs, calves, and ankles. Tortoise Pose, or Turtle Pose, is named for these shelled critters for more than one reason. Not only does the pose look like a tortoise, but it is also intended to draw your attention to your inner thoughts. It can be difficult to achieve, and there are many variations. Benefits of practicing this asana daily are that it strengthens the back, tones the abdominal organs, encourages flexibility in the hips and quiets the mind. Considering the traditional Hindu reverence for cows, it’s not surprising that the asana is named after this gentle creature. Cow Face Pose can be intense for the entire body. Thus, this pose isn’t easy to perform and needs to be worked on it regularly. However, practicing this posture regularly benefits the shoulders, chest, arms, hips, and thighs. Most must have tired Kakasana, the crow pose but have unknowingly done the crane pose instead. Crane pose also known as Kakasana is very similar pose to Bakasana or Crow Pose. Although, the crow pose is much easier than the crane pose for most. These benefits of these asanas are that they tone the abdominal organs, opens the groin, strengthens abdominal muscles, shoulders, upper back arms, and wrists. In crane pose arms are extended, higher and in slender position upwards while in cow pose arms flexed at an angle of 90 degrees, lower and more compact position. In crane pose back is slightly rounded while in crow pose the back is straight. In crane pose the knees are supported as close as possible to the armpits without protruding but in crow pose knees are resting on the elbows or on the back of the arms and out. In crane pose the feet together but in crow pose the toes together as ‘wings’. Peacocks symbolize immortality and love in Hindu culture. Peacock Pose is an advanced pose that requires attention to the whole body in order to hold alignment. This pose has many variations, including the challenging Feathered Peacock Pose (Pincha Mayurasana), in which the legs are lifted back and up against a wall — and, for advanced students, eventually lifted away from the wall. Mayurasana strongly affects the liver, gallbladder, pancreas, intestines, kidneys, and circulatory system, as well as the nerve plexus in the abdomen. 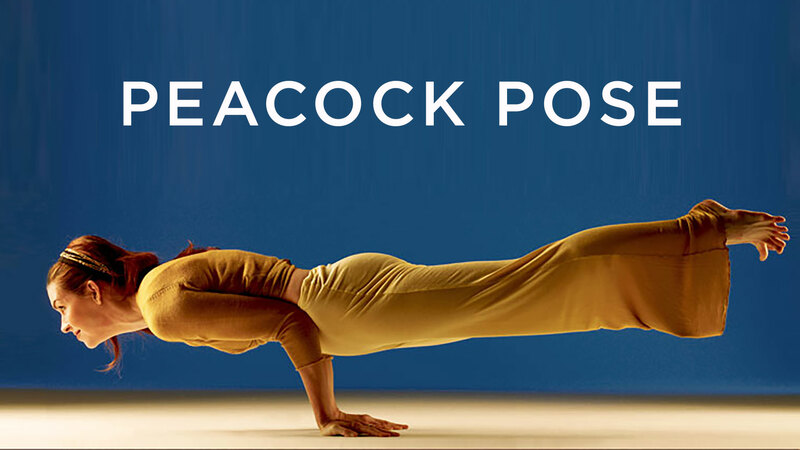 As a result, the peacock pose strengthens and tones digestion, invigorates the entire body, and is particularly treasured for cleansing and eliminating toxins. One form of this pose requires you to keep the toes together, which resembles a scorpion more than the advanced pose, which requires you to lower your feet all the way to your head. Benefits from Scorpion Pose are that it makes your body flexible; stretches and expands your chest, shoulders and hip flexors. Also, Vrschikasana (Scorpion Pose) strengthens your spine, arms, forearms, and torso too. In case you couldn’t tell from the photo, this pose is not for beginners! Great for all ages, this pose can be playful, practical, or deeply restorative. Frog Pose is considered a difficult pose, so the Half Frog Pose variation is more common. Bhekasana is a great posture from which to enter other deep hip openers or arm balances like Crow. Therapeutic applications of Frog Pose include alleviating menstrual cramps, low back pain, and constipation. Plus, this asana fittingly benefits the throat, chest, hips, ankles, and feet. A favorite among the youngest of yogis, Lion Pose assumes the sitting position and facial expression of a lion. From the Sanskrit word Simhasana, Lion Pose mimics the bold stance of the king of the jungle and evokes the lively spirit of the animal. The pose combines both asana (physical posture) and pranayama (breath work) to produce a roaring deep exhalation during the peak of Lion Pose. The Benefits of Lion Pose (Simhasana) is that it helps release tension and reduce stress. The pose opens the throat, jaw, and neck which can help with jaw/neck pain and stimulate the throat chakra. It also stretches the face muscles and the chest. Named after the Hindu deity Hanuman, who resembled a monkey, the pose comes from a famous tale in which Hanuman makes an epic leap from India to Sri Lanka. Monkey Pose is an advanced thigh, hamstring and groin stretch. This is a highly beneficial stretching the thighs, hamstrings, groins which also stimulates the abdominal organs. It may look simple, but maintaining the right balance in this general shape of a locust can be very challenging. Salabhasana requires a great burst of energy, reminiscent of a sprightly locust’s leap off the ground to gracefully throw itself backward. The effort of lifting off the ground and staying there for even a few moments is intensity, teaches focus, encourages mindful work, and ideally leaves you feeling tranquil yet alert. This pose benefits the back, buttocks, and hamstrings. Vatayanasana is an intermediate yoga asana practice that requires a deep sense of focus and endurance to come into and stay in this pose. A little similar to Cow Face Pose and Eagle Pose, Horse Pose requires intense focus. It requires strong ankles, and benefits the neck, back, abdomen, knees, and calves. Rabbit pose alternately called hare pose, hare headstand, and Sasangasana is an asana that evokes nostalgia for childhood playfulness, a deep connection to nature, and the calm gentleness of bunnies. The inverse of camel pose, this is among the poses that really does resemble its namesake. One variation of Rabbit Pose is to press your palms firmly beside your knees, letting forearms line up against the front your thighs and widening the shoulder blades. This pose helps to stretch the neck and upper spine along with relaxing effect on the nervous system is an enormous bonus, and some people even find that practicing rabbit regularly helps them to fall asleep more easily. The throat lock of the pose is touted for its benefit to the thyroid and parathyroid glands, and many yogis find the rabbit pose to be an effective aid for relieving sinus problems and head colds. Firefly pose is an arm balance pose that requires more core strength than arm strength. An advanced arm balance posture that benefits the inner thighs, arms and wrists. It mimics the way a firefly looks when it’s in flight. Thank you for the comment. The content has been updated. However, the King Pigeon is correctly posted. In case, you are talking about One-Legged Pigeon Pose (Eka Pada Raja Kapotasana), it has also been added to the article. Helpful Yogi, I notice the same. For some reason much of the Internet sites are mixing up the Sankrit and English and posting incorrect versions of many language translations and poses. Translating from Sanskrit to English, Raja means King. Eka means one. Pada means foot. Kapato is a pigeon-like bird. And Asana is seat or pose. Sometimes the Mysore version of Ashtanga has slightly different names for poses, but MOST other lineages of yoga are using the poses and terminology recorded by Iyengar in “Light on Yoga.” So Kapotasana is pigeon pose, but it’s not “King” Pigeon Pose as translated in the article above. The picture in this article is showing the Iyengar version of Kapotasana and NOT showing what that is incorrectly translated to in English “King” Pigeon Pose.. Rajakapotasana translates into King Pigeon pose and that is the one where the person is on stomach/pelvis and BOTH feet are touching the head. Eka Pada Rajakapotasana is the ONE LEGGED version of the above and there are the variety of variations you have all seen of one leg touching head or similar gradations. So you can tell just by knowing the Sanskrit that they are the same pose, but the regular is both feet and the Eka/one is with one foot. Again, different schools sometimes change the name around, but the majority of mainstream go by Iyengar standards which can be looked up in his book. I’ve noticed that a few largely visited Internet sites (even parts of Wikipedia) have incorrect info that has now been spread to most sites kind of like that telephone game where info starts one way but ends in a completely different message. Thank you very much for your valuable comment, we really appreciate it. We have updated the title and hope its the correct one now. Once again, thank you!